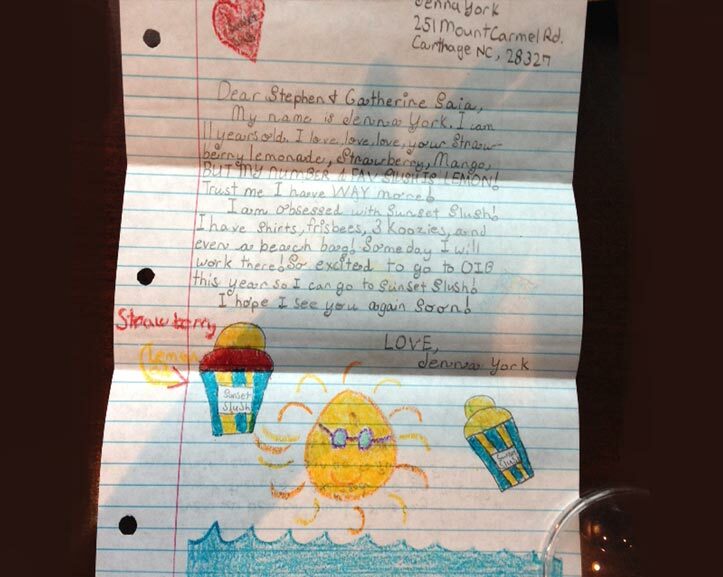 I am writing to you to compliment your Italian Ice. 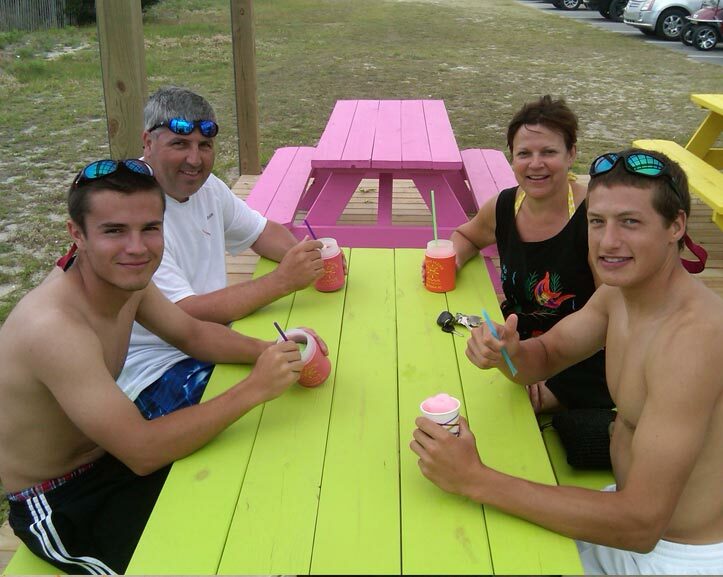 My family loves your Italian Ice. My favorite is Peach and Lemon. I hope the business stays open. Out of every Italian Ice I’ve tried Sunset Slush is the best, in my opinion. After I had one, I was addicted. I hope when I come back Sunset Slush will still be there. We were tickled when we heard your message when we got back from the beach last evening. Nice to know we are such valued customers that we get personal notification of operating hours. Talk about customer focus! Actually, we missed you by about 45 mins last night as we had trouble getting Charlie & Catherine off the beach. Maybe it’ll be easier to get them moving next time. Your “slushies” are quite an incentive. Just wanted to let you know so you don’t put out a missing persons report when we don’t show up. Thanks again for being such a great part of the beach memories they are making. Looking forward to seeing you lots over the next couple weeks. 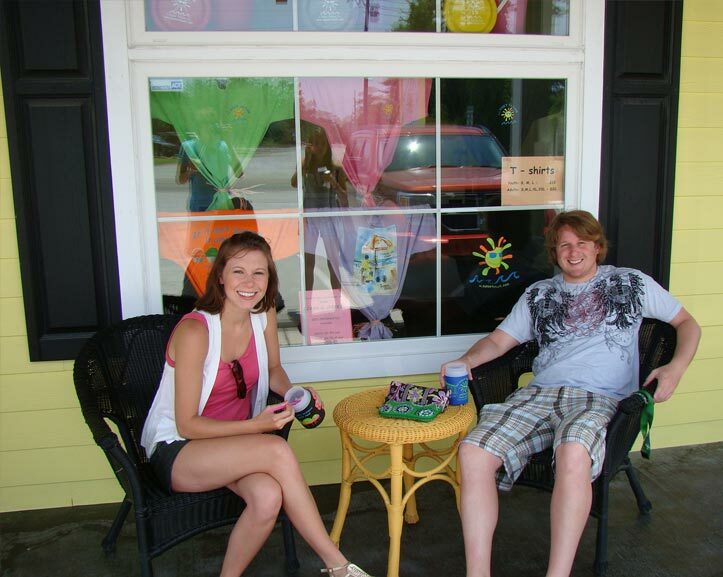 My friend and I have been vacationing on Oak Island, NC and North Myrtle Beach. 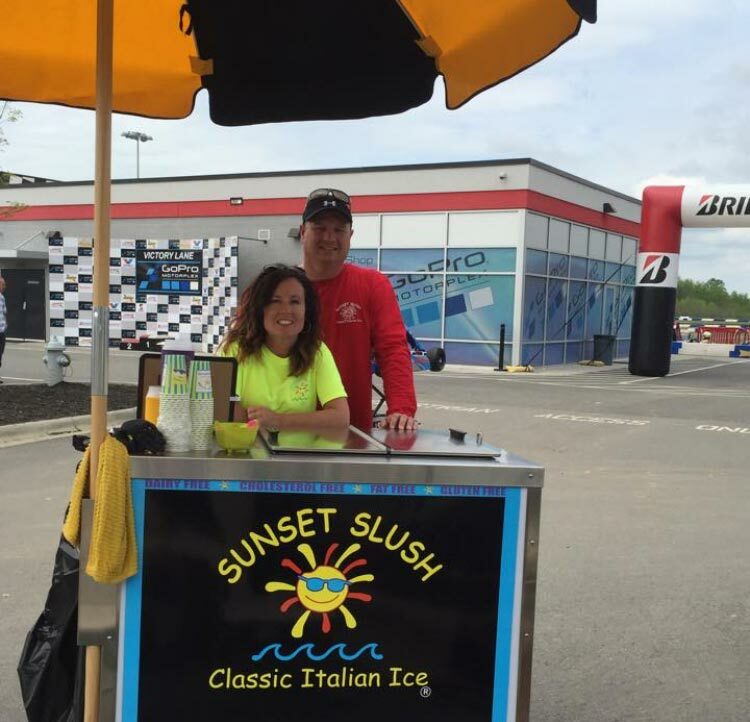 We LOVE Sunset Slush and were curious if we could order it or find it anywhere near Nashville, TN. Please let me know! Thanks!!! 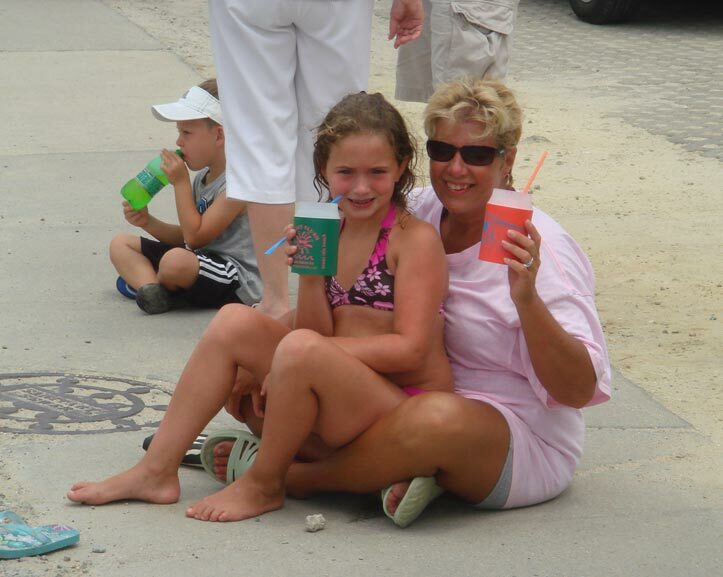 We were just at OIB and LOVED the Sunset Slush. We bought one and sometimes two EVERY DAY we were there. We always got one from Pat or Wally and they were great! I would love to send you a photo that we took with our kids, their slushes, and Wally. Please send me your email so I can forward it to you. Thanks. Thank you so much for allowing the Sunset Slush carts to serve the guests of Ocean Isle Beach. It is such a treat to see them coming with a refreshing cup of Italian Ice. They are very nice and accommodating. We make sure we bring koosies on vacation every year. Thank so much for the outstanding customer service and passion you shared aout your product this past week, I’ve always felt food service, whether it be in a streak hours or at an Italian Ice carry out window, is the difference between a ho-hum experience and something truly MEMORABLE. My family is already wondering if DRY ICE and a good Styrofoam crate would support a medium sonic through FedEx to Barberton OH…. I told them I’d ask you. Seriously, WOW! Great times and great tastes. Keep up the community support and BRAVO. Eccellente! Grazie Graizie! 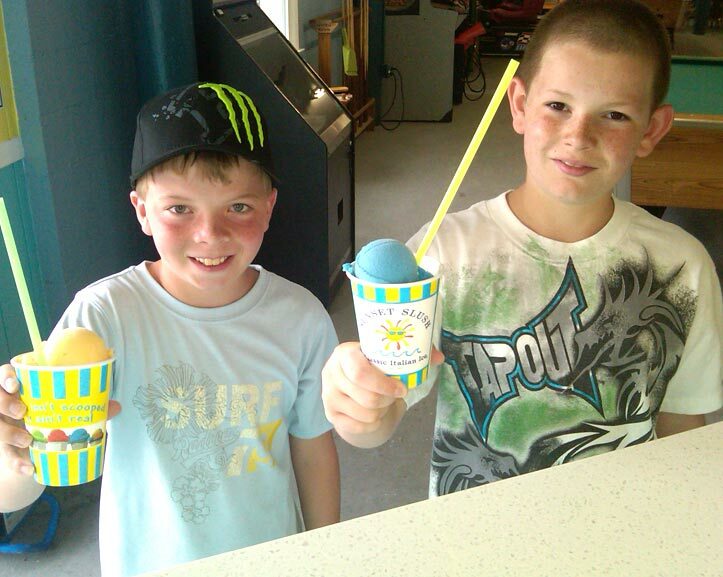 "The second best place at the beach....first is the ocean where you can also get the best slushy around. We love Sunset Slush!!!"